Ford has become the first automaker to pilot the Stratasys Infinite Build 3D printer with a view to adopt the technology for prototyping and production of large-scale one-piece auto parts, such as spoilers. 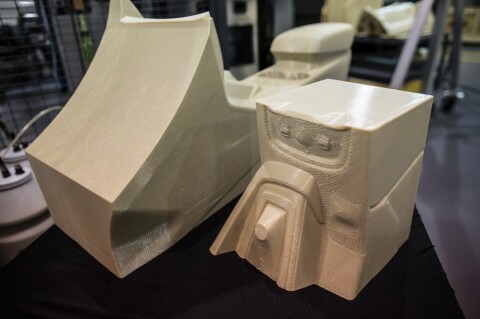 The Stratasys Infinite Build system is capable of printing automotive parts of practically any shape or length, and Ford believes the technology could provide a more efficient, affordable way to create tooling, prototype parts and components for low-volume vehicles such as Ford Performance products, as well as personalised car parts. Ellen Lee, Ford technical leader, additive manufacturing research, said the new 3D printing system – housed at the company’s Research and Innovation Centre in Dearborn – could be a breakthrough for vehicle manufacturing. “With Infinite Build technology, we can print large tools, fixtures and components, making us more nimble in design iterations,” Ms Lee said. Ford believes that 3D printing would allow the company to produce lighter-weight parts, which would translate into greater fuel efficiency. According to the company, the technology would also substantially cut the time needed to develop and validate a new product design. “Using traditional methods to develop, say, a new intake manifold, an engineer would create a computer model of the part, then have to wait months for prototype tooling to be produced,” Ford said in a statement.